Migraine is a common and disabling headache condition that affects more men than women. It is regarded as one of the top twenty disabling health conditions by the World Health Organisation, because of its impact on the daily life of people who suffer regular migraines. Understanding migraine better means that it can be managed more effectively. One of the first steps towards dealing with migraine, both for the person affected and the health professionals treating them, is to classify the type of migraine they suffer from most of the time. Extensive research has been done to classify migraine and there are many different types. The main forms of migraine have been described in an official classification by the International Headache Society. Overall, there are six major classifications: migraine without aura, migraine with aura, childhood migraine (called childhood periodic syndrome), retinal migraine, complicated migraine and probable migraine. This type of migraine is described as a severe headache that lasts between 4 hours and three days, that affects one side of the head only, and that tends to pulsate. To be classified as a migraine, the headache must also be accompanied by other symptoms – nausea, with or without vomiting, light sensitivity, noise sensitivity, and the pain is usually made worse by activity. There are no preceding symptoms that are typically described as an aura; the start of the attack is when the pain starts. This may then become worse. In this type of migraine, the symptoms that precede the headache are the most important criteria for diagnosis. An aura can be very different in different people but usually involves seeing flashing lights or shapes, and/or losing vision or experiencing blurring of their vision. These are caused by electrical disturbances that spread through the cortex of the brain. 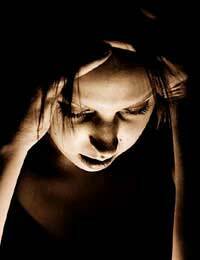 An aura can develop within 20 minutes to an hour of the pain of the migraine. In rare cases, the aura is not followed by pain. Some people also get other symptoms such as strange sensations in their arms and legs and a feeling that all is not right. Having pins and needles, numb areas of skin and being unable to move properly are commonly recognised signs of migraine aura. These symptoms disappear completely as the headache pain begins. A specific type of migraine with aura is associated with mutations of specific genes and is diagnosed as familial hemiplegic migraine. The aura in this type of headache usually involves weakness of the body down one side but, like other forms of aura, this is temporary and the person affected recovers completely once the headache pain begins. This type of headache in someone with no family history is known as sporadic hemiplegic migraine. An additional rare migraine with aura, basilar-type migraine, involves no muscle weakness, tingling or numbness, but the visual symptoms are severe, and there may also be tinnitus, vertigo and the person may start to lose consciousness. Migraine often starts in childhood but the typical pattern of a one side pulsating headache often doesn’t start until adolescence or even early adulthood. Many children with migraine start experiencing attacks of severe nausea with frequent vomiting, which become regular and are not linked to a problem with the stomach, such as food poisoning. Children affected typically feel very sick and are sick four times in an hour; this can last just an hour or much longer and can be very distressing. People with this type of migraine experience visual problems that are much more severe than a typical aura and these continue throughout the migraine. Flashing lights are common but people often lose their vision completely, or lose spots of vision. This classification includes chronic migraine – which occurs on at least 15 days per month, constant migraine that never relents, an aura that becomes permanent, a migraine-induced seizure and a migraine that is associated with blood vessel damage in the brain. This final classification is used to highlight that a person is showing the signs of one of the major migraine types, but there is not enough evidence to confirm the diagnosis. This is done subsequently by asking the person to keep a headache diary over a period of weeks and months, so that the type of migraine they have can be identified. My daughter has been diagnosed with migraine as she has most of the symptoms, so her neurologist said it was a classic one; He prescribed her Amitriptyline to make the attacks less frequent and Imigran, (sumatripan) to help with the pain; My daughter is 16, and she started both pills; After a while, I found out that she's taken only 2 pills of the Amitriptilyine and then stopped it, because she experienced some side effects, (puffy eyes and too lethargic). She kept taking the sumatripan, for which she said that it didn't help the pain much, if not at all... Three months after she's been diagnosed, we need to go back to the neurologist, because she refuses to take the Amitriptilyine but is suffering a lot; Her symptoms are: squeezing pain on both sides of the head, loss of vision and sometimes double vision, nausea, once in a while, vomiting, unwillingness to move, walk, etc. All her symptom seem a lot like depression too, so I was wondering which is first, (as my daughter has been bullied at school, has shown some anxiety symptoms in the past, and is very, very sensitive) - depression or migraine, or they exist next to each other and 'feed' from each other; I don't know, but this debilitating condition is taking my girl down a rabbit whole, and it's dark there and I can't help her; We've tried a variety of alternative therapies: she visited several times an osteopath, who does cranial massages, an acupuncturist, who also does reiki, she started recently meditation with a very good personal teacher, and as she's had some very depressive thoughts recently, she met a therapist. She now chose to only continue with the meditation and the therapy; I don't know as a mum if I am doing all that's possible; It is very difficult not only for her, but for the whole family; If you have a thought or can recommend a therapy that might help my daughter, please leave a note. Thank you!